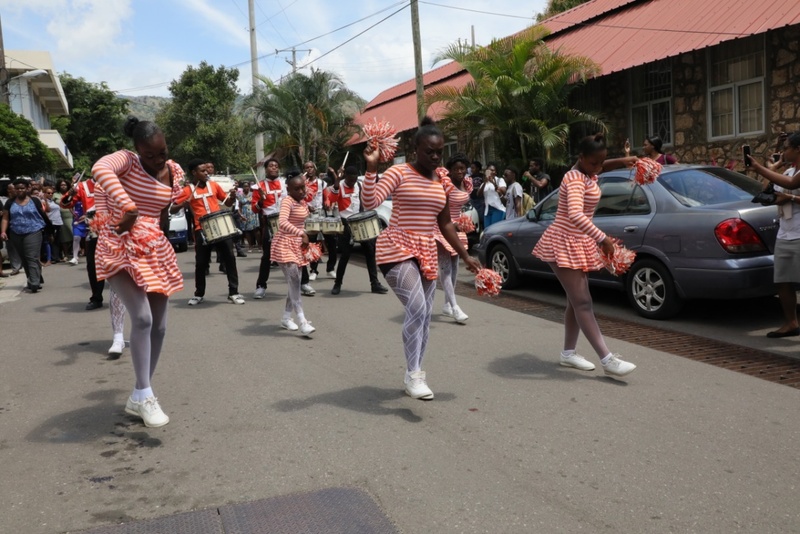 UTech, Jamaica Launches 60th Anniversary Celebrations — UTech, Ja. 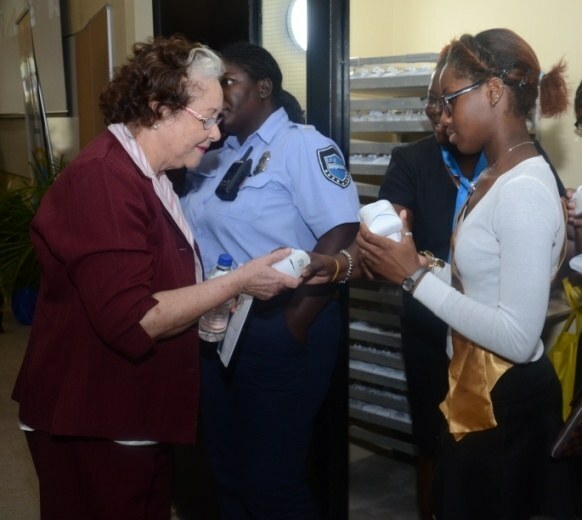 60 YEARS STRONG: Participating in the Cutting of the UTech, Jamaica 60th Anniversary Cake (from left), Alecia Bailey, Miss UTech, Jamaica, first year School of Computing and Information Technology (SCIT) student, the Most Hon. 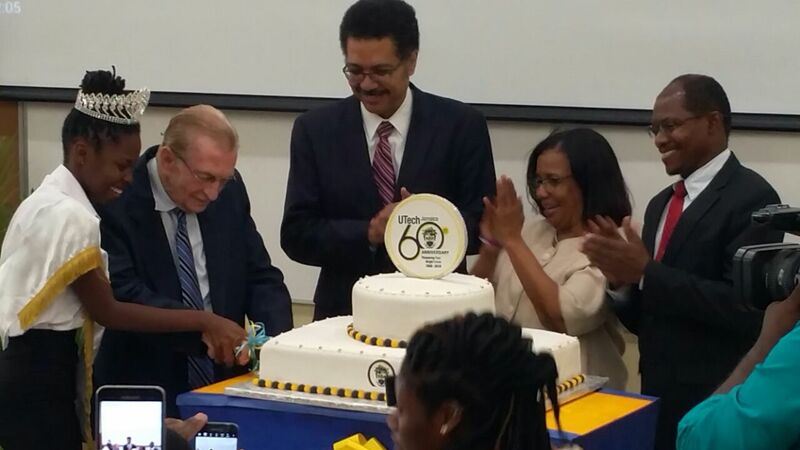 Edward Seaga, ON, PC, Chancellor, Professor Stephen Vasciannie, CD, President, Mrs. Mercedes Deane, University Registrar and Professor Colin Gyles, Deputy President at the ceremony for the launch of UTech, Jamaica’s 60th Anniversary celebrations on Tuesday, March 20, 2018, Shared Facilities Building, Papine Campus. The UTech, Jamaica story is a remarkable portion of Jamaica’s history. 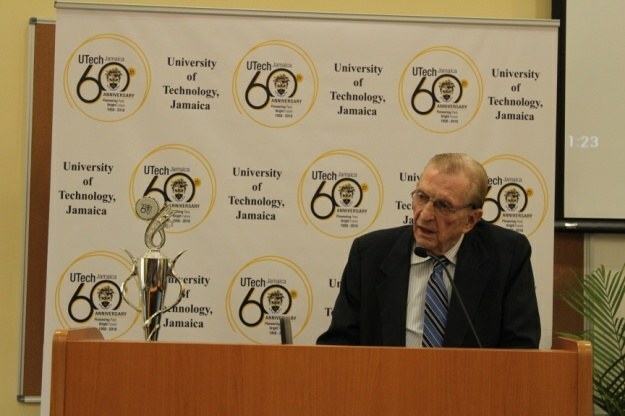 The history of the institution is intimately connected with the social and economic development of our country.” This defining statement by Chancellor, the Most Honourable Edward Seaga, ON, PC framed his well-received keynote address at the ceremony for the launch of the University of Technology, Jamaica’s 60th Anniversary celebrations held on Tuesday, March 20, 2018 at the Shared Facilities Building, Papine Campus. The Chancellor went on to note that “the University has played a major role in every facet of national development, with a tradition of excellence, dating back to its founding in 1958, a few year’s shy of the country’s independence in 1962.” He shared that the Institution began as the Jamaica Institute of Technology (JIT) in 1958 with 50 students and 4 programmes. A year later in 1959, the Institution’s name was changed to the College of Arts, Science and Technology (CAST) and on September 1, 1995 was formally accorded university status as University of Technology, Jamaica. Senator the Hon. 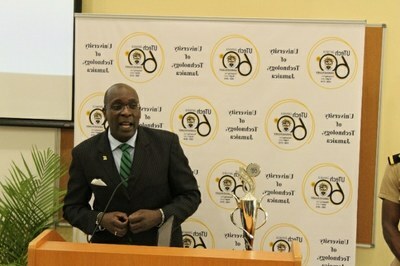 Ruel Reid, CD, Minister of Education, Youth and Information addressing the launch ceremony. Minister of Education, Youth and Information, Senator the Honourable Ruel Reid, CD, JP brought greetings. In his remarks he reiterated the Government’s commitment to facilitating the university’s establishment of its own law school. “You have been blessed with good leaders and visionaries,” he said, adding that “we are at one with regards to supporting your thrust to establish your own law school.” The Minister further noted that the government is also working to create greater equity among tertiary institutions. 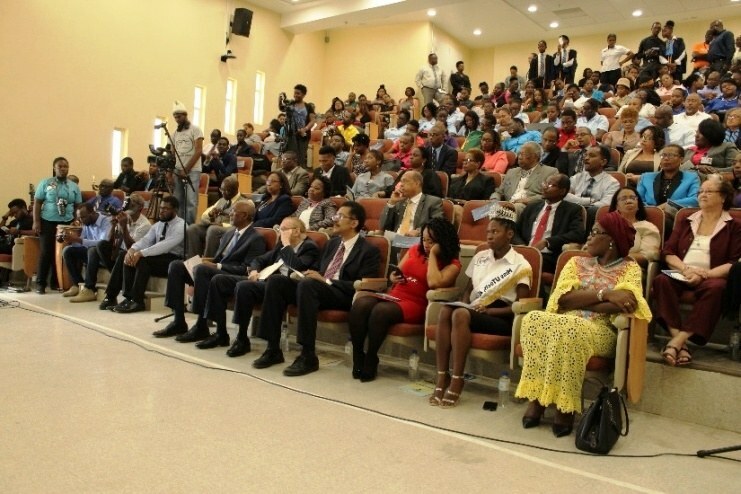 “ We want to create greater equity in terms of the alignment, in terms of compensation for UTech within a policy framework that we have to clearly articulate for funding of tertiary institutions by the government,” he said, to approving applause from the large of gathering of university academic and administrative staff. Professor Stephen Vasciannie, CD, President, UTech, Jamaica addressing the launch ceremony. President, Professor Stephen Vasciannie, CD, in his address highlighted milestones achieved by the university over its 60 year history. Among them: the first degree programme in technical education in 1986 which paved the way for many more degree programmes being added in succeeding years in all departments; the opening of the Caribbean Sculpture Park in 1999 – the only one of its kind in the English-speaking Caribbean; the opening of the Caribbean School of Architecture in 2001; the establishment of new faculties and colleges, namely the Faculty of Law, Faculty of Science and Sport and the Joint Colleges of Medicine, Oral Health and Veterinary Sciences in 2008, 2010 and 2012 respectively. Pointing to recent milestones, the President further noted the successful completion of the Shared Facilities Building in 2017 which has provided much needed additional teaching and learning spaces for students and faculty and for the hosting of university events. He also mentioned the establishment of the University of Technology, Jamaica Press in February 2018. Looking forward, Professor Vasciannie said that “as UTech, Jamaica contemplates its past and looks to its continued future role in nation building, our university must remain committed to our mission to stimulate positive change in Caribbean Society through the provision of high-quality learning and research opportunities and service to our communities.” He encouraged faculty, staff and students to build on the well-laid foundation in renewing commitment to UTech, Jamaica’s advancement as a world-class centre of excellence. 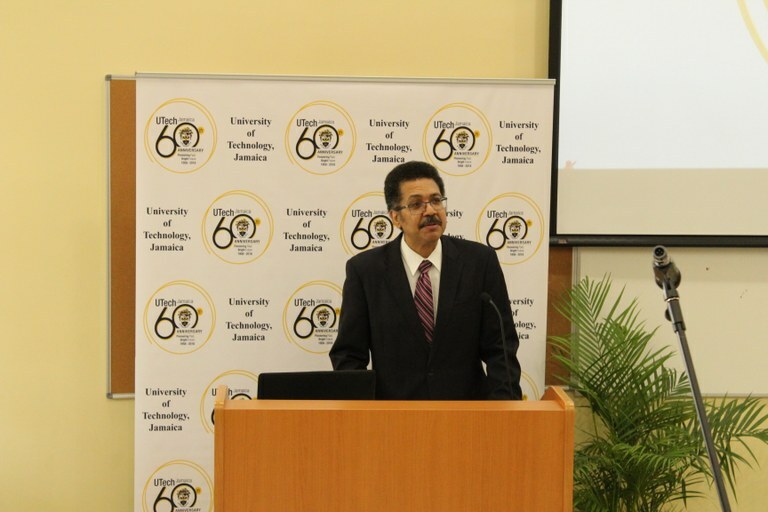 Chairman of the 60th Anniversary Committee, Mr. Hector Wheeler, Associate Vice President, Advancement, UTech, Jamaica introduced a short video presentation which highlighted the activities for the 60th anniversary year-long celebrations. These include a special 60th Anniversary Art Exhibition, community service initiatives, special 60th anniversary publications including a newspaper supplement and a coffee table book on the University, special 60th anniversary student scholarships, a series of distinguished lectures, college/faculty awards and student-led conferences. There will also be a 5k -10K marathon; the annual Track and Field Classic, President’s Knights Day, events honouring alumni and retirees and the annual Staff Awards, among other activities. 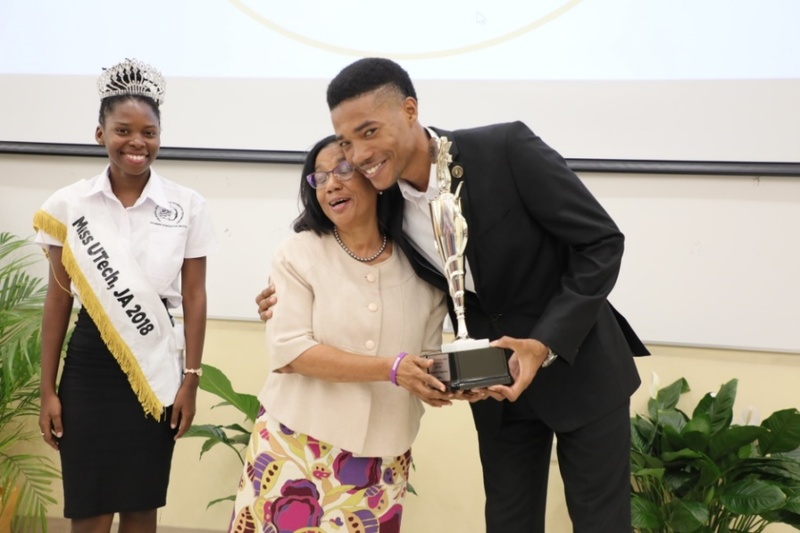 The Vote of Thanks was ably moved by recently crowned Miss UTech, Jamaica, Miss Alecia Bailey, a first year School of Computing and Information Technology (SCIT) student. Among the specially invited guests who were in attendance were Her Excellency Janet Olisa, Nigerian High Commissioner to Jamaica, Dr. Carolyn Hayle, Chairman, University Council of Jamaica, Mr. Aldrick McNab, member of Council, Reverend Ronald Thwaites, MP, Opposition Spokesperson on Education and Training, Mrs. Viralee Latibeaudiere, Advisor and representative of Hon. Fayval Williams, MP, Minister of Finance and The Public Service and Mr. Earl Samuels, former member of Council. 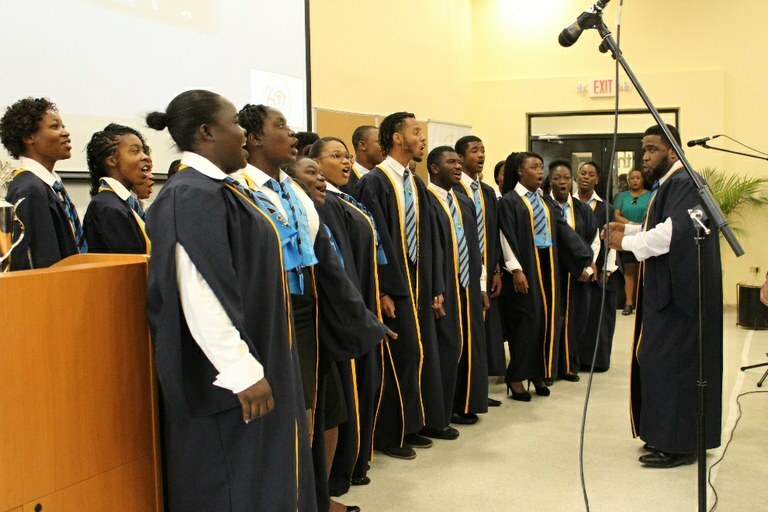 The UTech, Jamaica Choir delivering a stirring rendition of the song “Ain’t Got Time to Die” conducted by Choir Director, Mr. Hugh Douse. 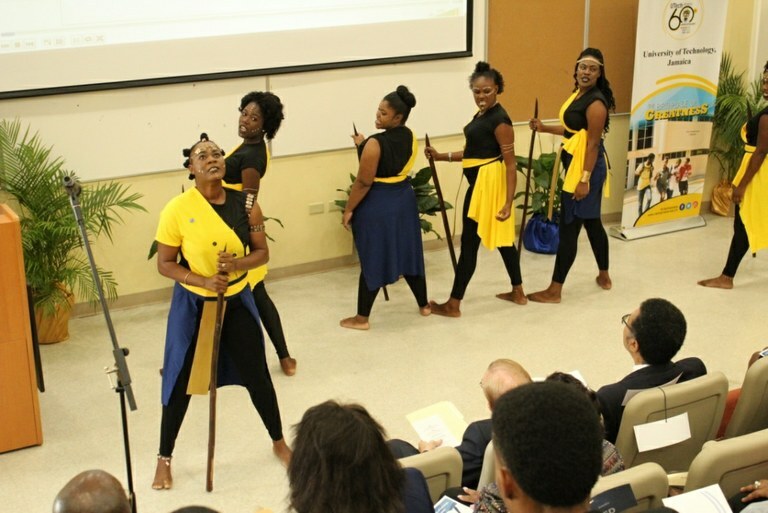 An appreciative audience watch the UTech, Jamaica Dance and Theatre Art Elective Group perform the piece “Knights” written by Drama tutor, Ms. Gracia Thompson. 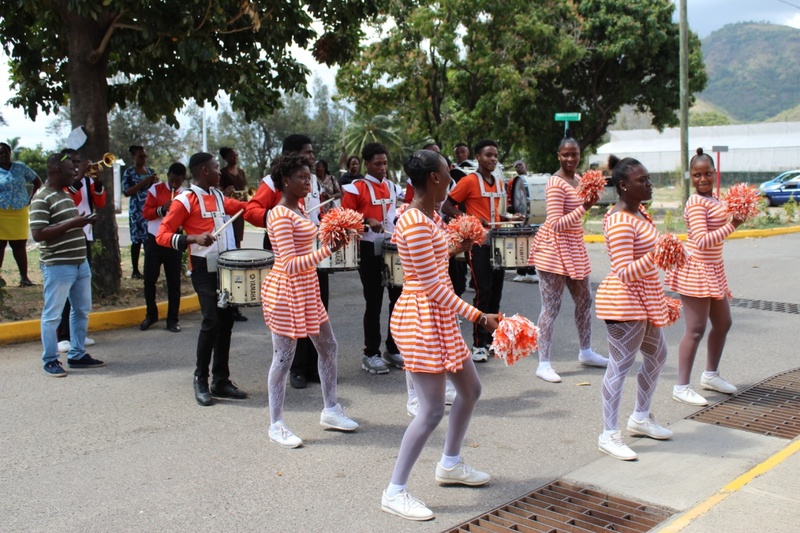 Special guest band, the Tivoli Marching Band along with uniformed groups from the UTech, Jamaica community kicked of the 60th Anniversary celebrations with a road march which began at the front field and culminated at the Shared Facilities Building ahead of the launch ceremony. Staff and students gathered to watch and capture images of the Tivoli Marching Band led procession on their SMART phones. 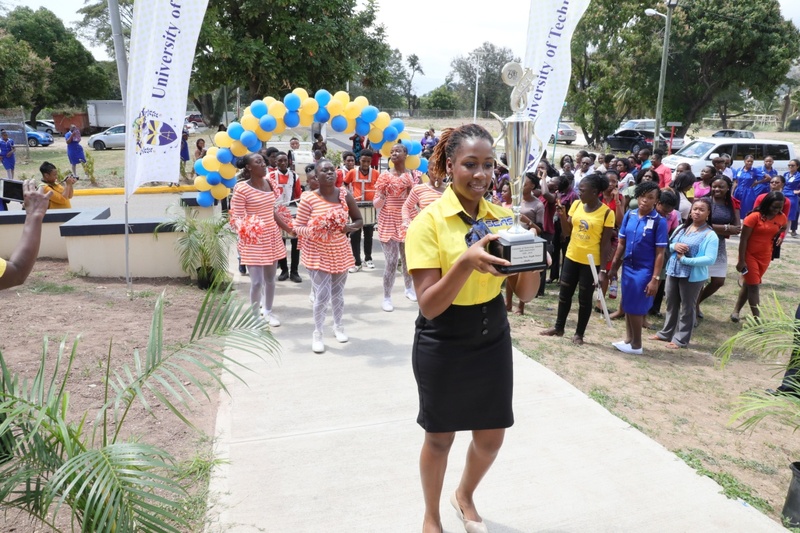 Miss Ashley Hall, Administrative Assistant, Examination Centre holds the 60th Anniversary Symbol as she leads the procession into the Shared Facilities Building for the start of the launch ceremomy. Mrs. Mercedes Dean (centre), University Registrar and Mr. Granville Knight, UTech, Jamaica Students’ Union President share a warm hug after he presented her with the 60th Anniversary Symbol during the launch ceremony. Sharing in the symbolic occasion at left is Miss UTech, Jamaica, Miss Alecia Bailey. 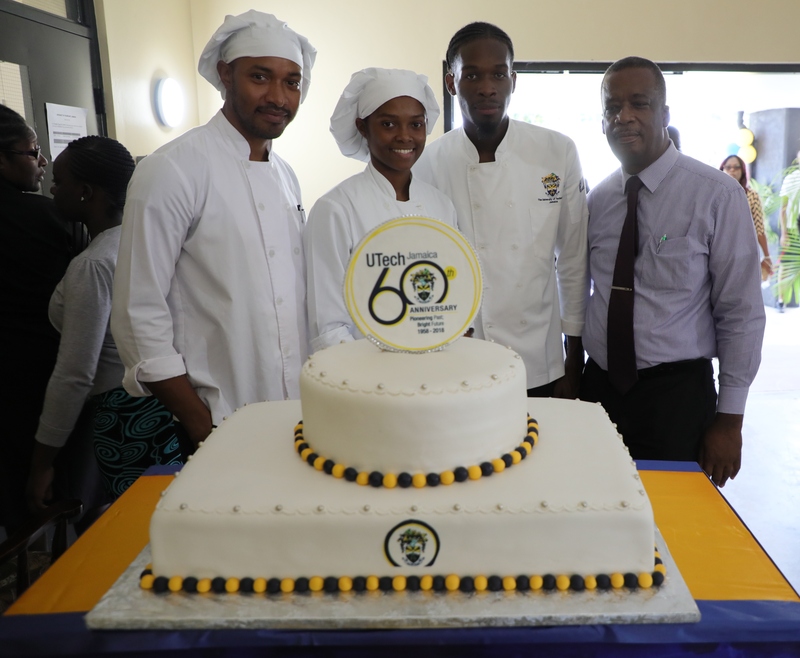 The 60th anniversary cake was baked by a team from the School of Hospitality and Tourism Management (SHTM) led by Mr. Winston Piper (right), Lecturer, SHTM. The team of students (from left) Andre McBean, Chantoy Keith and Owayne Smith show off the delicious creation. 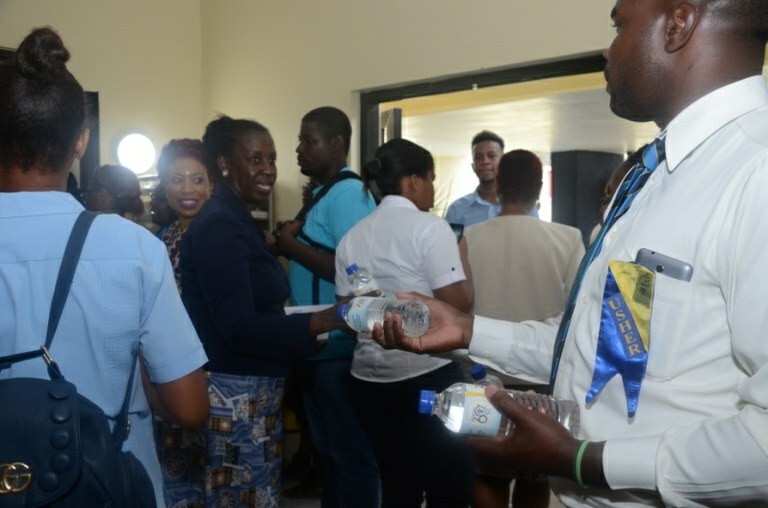 (At top) Mrs. Pamella Kelly,(left) University Orator and other members of staff (below) were happy to receive a gift box with anniversary cake and 60th anniversary branded bottled water, as they recessed from the launch ceremony.